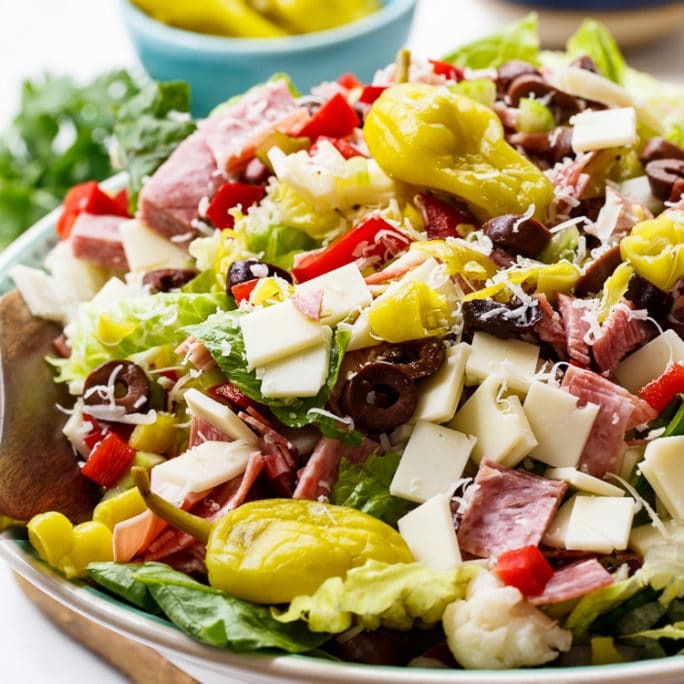 Tex-Mex Cobb Salad is a colorful salad with lots of south of the border flavor. 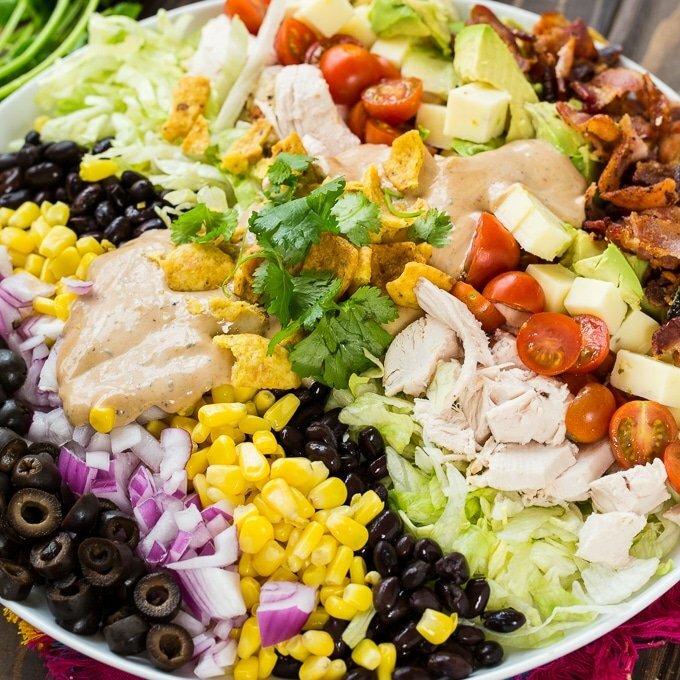 Chicken, hard-boiled eggs, avocado, corn, black beans, bacon, tomatoes, and red onion are covered in a BBQ Ranch Dressing. A cobb salad is so classic and it’s one of my favorite types of salad. 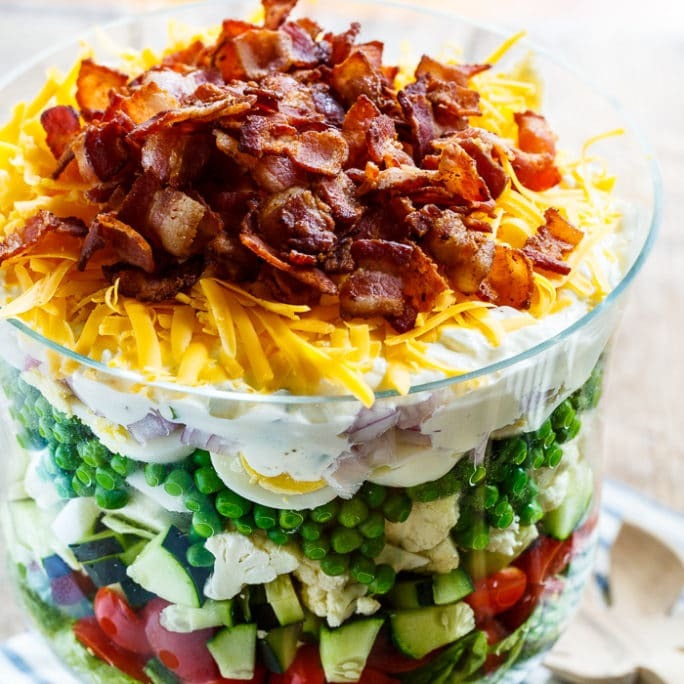 It can be fun to do creative twists on a traditional cobb salad like this Southern Cobb Salad. 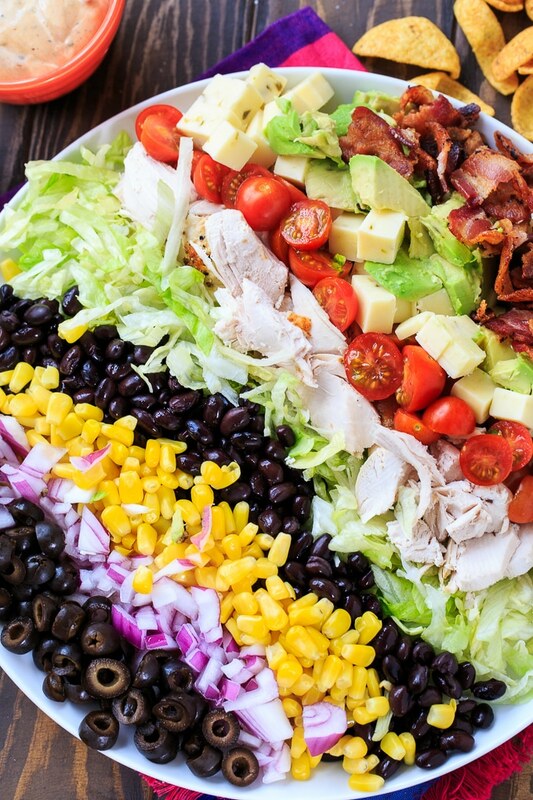 A traditional cobb salad consists of chicken, bacon, tomatoes, avocado, blue cheese ,and lettuce. Instead of blue cheese, I’ve used chunks of pepper jack cheese and I’ve added corn, black olives, and black beans. Plus some Frito corn chips for something crunchy! For the dressing I mix a little BBQ sauce into some Ranch dressing. It gives the ranch a little kick and a smoky/sweet flavor. What I love most about a cobb salad is that it is a full meal kind of salad. The kind that leaves you with a very full belly. This one is loaded with filling protein- chicken, bacon, and eggs. 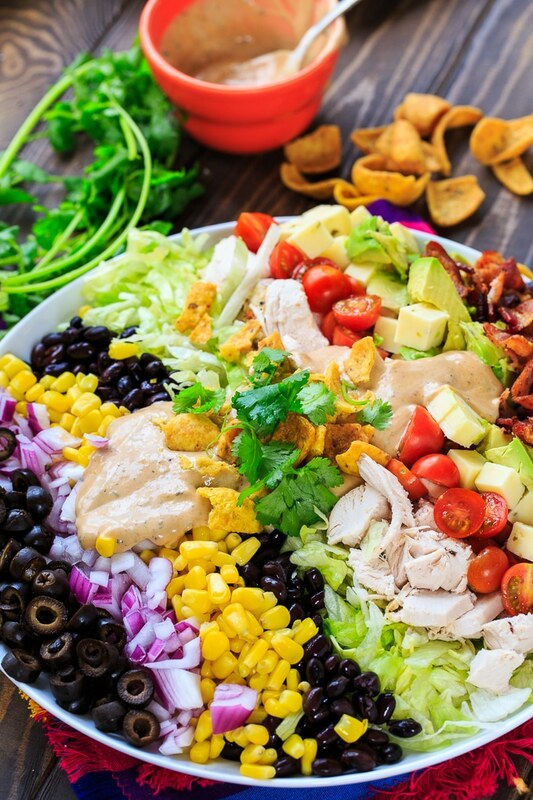 Tex-Mex Cobb Salad is a colorful salad with lots of south of the border flavor. Arrange all ingredients except cilantro and corn chips in rows on a large platter. In a small bowl, mix the Ranch dressing and BBQ sauce together. 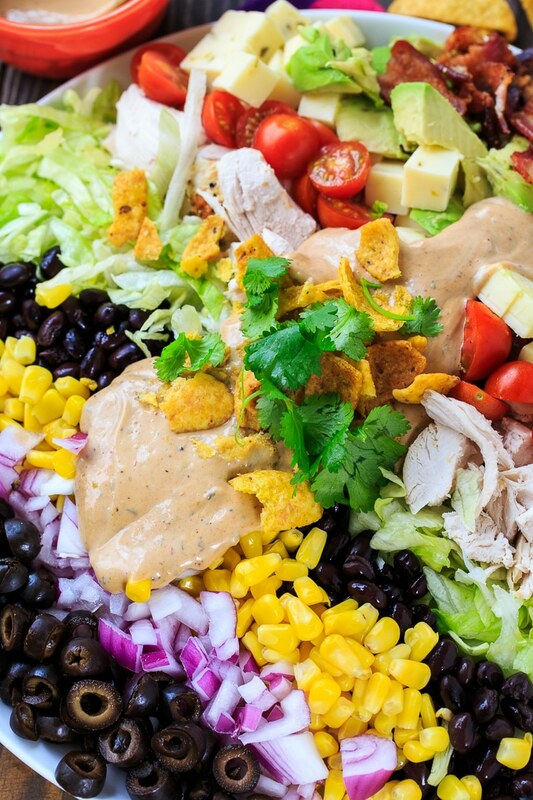 Pour dressing on top of salad and sprinkle with cilantro and corn chips. This entry was posted in Salads and tagged cobb salad, salad. Bookmark the permalink. Hi! I was wondering if this is a gluten free salad?